We’d love your help. Let us know what’s wrong with this preview of A Life Less Throwaway by Tara Button. Tara Button has become a champion of a lifestyle called ‘mindful curation’ – a way o Now more than ever, we live in a society where we covet new and shiny things. Not only has consumption risen dramatically over the last 60 years, but we are damaging the environment at the same time. That is why buying quality and why Tara Button’s Buy Me Once brand has such popular appeal. To ask other readers questions about A Life Less Throwaway, please sign up. Great for rich white people who are judgmental and want a giant advertisement for a blog. Otherwise, straight up irritating and inspires nothing. Literally, not a single moment spent on the fact that cheap, shoddily made products are often all that's available for many and that's not their fault. It's a bigger structural problem and frankly, sending Apple a tweet to ask them to make more sustainable products isn't going to solve that problem. But hey, it invites a few more moments to be Holier T Great for rich white people who are judgmental and want a giant advertisement for a blog. Otherwise, straight up irritating and inspires nothing. Literally, not a single moment spent on the fact that cheap, shoddily made products are often all that's available for many and that's not their fault. It's a bigger structural problem and frankly, sending Apple a tweet to ask them to make more sustainable products isn't going to solve that problem. But hey, it invites a few more moments to be Holier Than Thou. Likewise, not a second of consideration for why the Marshmallow Test is also a flawed study; those who didn't show "will power" in not eating the marshmallow aren't failures. It's exceptionally possible they come from a world of lacking and they have never had reason to believe more would come if they didn't take advantage of the thing set before them. I agree with all the advice in this book, which pretty much boiled down to: Buy less and look after the things you have. But it just didn’t inspire me. A lot of the studies and quotes were familiar to me (e.g. the marshmallow test, the lightbulb conspiracy). There were a couple of statements that seemed borderline racist, and it was certainly a book for the rich. What does it offer? A pretty reminder that pots should last for life. If you’re lucky enough to afford such pots in the first place. Sometimes in life we need a reminder on how to be a grown-up. At least, I frequently do. In A Life Less Throwaway, The Lost Art of Buying For Life, Tara Button provides concrete steps for choosing and purchasing items that will last a lifetime-not just this week's trend. Reading this book was like having a great conversation over coffee. Button provides anecdotes and exercises on how to discover your personal style so you can make careful choices about your purchases. She describes how buyi Sometimes in life we need a reminder on how to be a grown-up. At least, I frequently do. 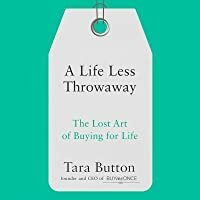 In A Life Less Throwaway, The Lost Art of Buying For Life, Tara Button provides concrete steps for choosing and purchasing items that will last a lifetime-not just this week's trend. Reading this book was like having a great conversation over coffee. Button provides anecdotes and exercises on how to discover your personal style so you can make careful choices about your purchases. She describes how buying less, but purchasing high quality items that last a lifetime, can simplify your life while also freeing up some space in your pocket book. Tara Button covers a range of topics from why items don't last like they used to-I'm looking at you washing machines-to how advertising affects our buying habits. There is also information on how she created her website and her own story of how overspending and keeping up appearances led to debt and unhappiness. 3.5 really. This was a library lend so I can’t really work through the exercises properly, and I skimmed some of the chapters that aren’t relevant to me (childless vegan who doesn’t wear makeup or follow fashion!). But a lot of handy tips and I have checked out the website several times since starting the book, and added a few good brands to my list of ones to check out when something needs replacing. Bottom line is to obtain things that will last and take care of them. For the most part, this has been our philosophy over the years but has anyone tried to get a flat-screen television repaired lately? Most modern-day appliances with electronic controls are pretty much "throwaways" which is horrible for the landfills. The author has suggestions on what and where to buy most anything although I ended up skimming some of the more detailed parts of the book. This is a nice addition for those more s Bottom line is to obtain things that will last and take care of them. For the most part, this has been our philosophy over the years but has anyone tried to get a flat-screen television repaired lately? Most modern-day appliances with electronic controls are pretty much "throwaways" which is horrible for the landfills. The author has suggestions on what and where to buy most anything although I ended up skimming some of the more detailed parts of the book. This is a nice addition for those more serious about simplifying their lives. 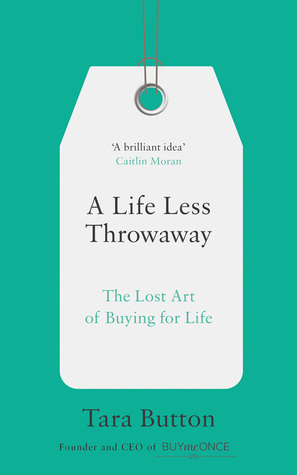 A brilliant book that sheds a bright light on our over consumption and throwaway culture. This book highlights the humanitarian and environmental impact of the western world’s continual need for things. How we are marketed to to believe we need new things frequently and how many products are often built not to last. But it’s also a book of actions, teaching you how you can declutter your life, be mindful of marketing tactics, steer away from fast-fashion, and look to buy sustainable, ethical products for longevity - reintroducing the lost culture of buying for life. I absolutely loved this book, and have walked away from it with actionable changes. I don’t often re-read but I would re-read this and use it as a reference. Author Tara Button encourages readers to discover what they love, curate a collection of meaningful, long-lasting items, and stop embracing and discarding trends with the rest of the Western world. However, instead of addressing over-consumption and its tax on the planet with vague, emotional argumentation, this author exposes the history of modern consumerism and advertising in detail, delving into the social and personal mental processes that lead to over-consumption and waste. For example, sh Author Tara Button encourages readers to discover what they love, curate a collection of meaningful, long-lasting items, and stop embracing and discarding trends with the rest of the Western world. However, instead of addressing over-consumption and its tax on the planet with vague, emotional argumentation, this author exposes the history of modern consumerism and advertising in detail, delving into the social and personal mental processes that lead to over-consumption and waste. For example, she explains how even when our items are not technically obsolete, marketers expertly stoke our desires for a replacement by changing product designs and making something look "so last year." She also addresses how common design practices impose a short lifespan on products so that consumers will have to buy them again. This book also includes sections on the impact that commercials have on culture and lives. Because the author used to work in advertising, she is an excellent voice to explain how manipulative commercials can be, and how even when they don't peddle misinformation, they are still explicitly designed to tap into subconscious desires and create felt needs for products that people might not care about if they were marketed less insidiously. In response to this, she outlines next steps for how to change shopping mindsets and habits. Because this book focuses on the mindsets and heart issues that drive people to over-consume and live wastefully, it is much more oriented to affluent people than to those who depend on cheaply made products in order to get by, but since affluent people are the ones more likely to trash the planet by following trends and buying and discarding items on a whim, it is appropriate for this book to be directed towards those with the means to finance wasteful lifestyles. The author encourages readers to consider their true values, reject consumerism, and change their thoughts, beliefs, and habits to create a more purposeful life, meaningful home, and healthier planet. She also has a resource to help people learn about products with longevity. Even though some Goodreads users have criticized this book for promoting the author's website, BuyMeOnce, she designed this website for the purpose of discovering and sharing information about the types of quality products that won't break down after a short period of use. I believe that this book is actually better for mentioning the website, because other books give generalized advice without providing any next steps or resources. It's clear that this author not only practices what she preaches, but also knows how to pass on her lifestyle values to others in a concrete way. I loved this book. It fit a genre that has been my current obsession lately, and this book nailed down the guilt that has been rising to my consciousness lately on consumption and wastefulness. I love the author’s passion for her topic and the business she has built, and I will be talking about this book to anyone who will listen! Another book about simplifying and living with less stuff, what sets this apart is the section on marketing and planned obsolescence. If you think you’ve been manipulated this will confirm it! This isn't a memoir of her life learning these lessons, but more of a guide. It is inspiring and I learned a lot. This was a great read. Some of tge later chapters were a bit more than I needed, but it seemed to have a broad audience. Hoping to implement as much as possible when I return home. The book is an okay to good choice if you wanna start to getting know more on how to tackle materialism influence on keeping us buy more and more. She mentioned her website quite often, but I don't see it is a problem (maybe because I don't live in UK most of the products was not sold in my country). But still, she explained her point in such a simple way and easy to understand. I could say it's an easy guide to live a more meaningful life. I am glad that I read this book before I get to work an The book is an okay to good choice if you wanna start to getting know more on how to tackle materialism influence on keeping us buy more and more. She mentioned her website quite often, but I don't see it is a problem (maybe because I don't live in UK most of the products was not sold in my country). A must read for anyone concerned with our over abundant lifestyles. A lesson on less is more and how to declutter your life and learn the art of "mindful curation". The author has some great tips on buying for quality and for life. great book! Well written and inspirational. A nice introduction to an excellent idea. Worth reading. Almost daily we read about, hear about, are social media-ed about downsizing, decluttering, being less wasteful, purchasing carefully and mindfully - you get my drift. So much advice, help, mindfulness, guilt trips, recycling, mental torment. In my own little way my 2018 New Year Resolution was to not buy any new clothes for 12 months, other than replacement underwear, socks, walking shoes, and Kmart sports gear. On the first day of a new year, I now look back and think I did pretty well, not pe Almost daily we read about, hear about, are social media-ed about downsizing, decluttering, being less wasteful, purchasing carefully and mindfully - you get my drift. So much advice, help, mindfulness, guilt trips, recycling, mental torment. In my own little way my 2018 New Year Resolution was to not buy any new clothes for 12 months, other than replacement underwear, socks, walking shoes, and Kmart sports gear. On the first day of a new year, I now look back and think I did pretty well, not perfect - I did buy a light weight travel jacket for an overseas trip, a skirt on my birthday, some seriously discounted winter woolies which have been put in the garage till next winter, and in a reversion to pre 2018 form, in November - yes 11 months it took - I had a little spree in Zara, but I have worn them all since. Plus I still have clothes in the wardrobe I have not worn, despite taking a pile to the opshop. Obviously still too many clothes, but the whole experiment has made me much more aware of how I shop, how I look at clothes, how I am not really that interested in just browsing for the fun of it. And also made me more interested in the psychology of buying - why we are somehow biologically programmed to acquire stuff, replace it or more likely replicate it, only bring things like wedding present silver out on special occasions, buy cheap for instant gratification. There are a number of self-reflective tests you can do to find your shopping style, your clothing style, getting your head around brands and advertising, how to declutter your living space literally cupboard by cupboard. Like all these sorts of challenges, you never set out to to it all at once, you will end up a blubbering mess. She suggests a cupboard or drawer a day, little by little. The only drawback to this, I see, is that by the time you have done every storage space you will have to start again as the detritus of modern life begins to accumulate again! Now that we’ve all cleaned out our homes the Marie Kondo way and have kept only the things that spark joy, the question becomes: how do we maintain it? Tara Button addresses this by helping us shift our mindset altogether about life and the things we collect. PICK. THIS. UP. NOW. Button starts this book with a strong study of manufacturing and consumer culture through the last few hundred years, citing studies that proved companies colluded to ensure products only worked for so long. She provides such a clear wake-up call to reconsider how I interact with the tangible objects around me. The second half of the book provides great templates and action plans for minimizing your home and buying (and taking care of) quality products that will last as long PICK. THIS. UP. NOW. Button starts this book with a strong study of manufacturing and consumer culture through the last few hundred years, citing studies that proved companies colluded to ensure products only worked for so long. She provides such a clear wake-up call to reconsider how I interact with the tangible objects around me. The second half of the book provides great templates and action plans for minimizing your home and buying (and taking care of) quality products that will last as long as possible, if not a lifetime. I had expected this book to be more of a tidying and housekeeping sort of book but it ended up being far more wholistic. It covered everything from the perils of the fast fashion industry to brainwashing and manipulations of the advertising industries. While the book is clearly from the perspective of someone from the UK, its easy to translate local euphemisms like "the hob" and "going on a mini break" into the American equivalents. Many of the points are valid and is a solid entry point into man I had expected this book to be more of a tidying and housekeeping sort of book but it ended up being far more wholistic. It covered everything from the perils of the fast fashion industry to brainwashing and manipulations of the advertising industries. I enjoyed parts of this book, like the research portions on planned obsolescence and how marketing companies manipulate audiences. Parts of it were tedious such as the portion about different types of clothes and their structures- there was literally a list with 30 different types of shirt collars!!! She did keep plugging her website (BuyMeOnce) but after checking the website, I can see why. There isn't a lot of items on it, so she needs people to give more feedback on products in order to drum I enjoyed parts of this book, like the research portions on planned obsolescence and how marketing companies manipulate audiences. Parts of it were tedious such as the portion about different types of clothes and their structures- there was literally a list with 30 different types of shirt collars!!! She did keep plugging her website (BuyMeOnce) but after checking the website, I can see why. There isn't a lot of items on it, so she needs people to give more feedback on products in order to drum up more website traffic (and have more products to choose from).